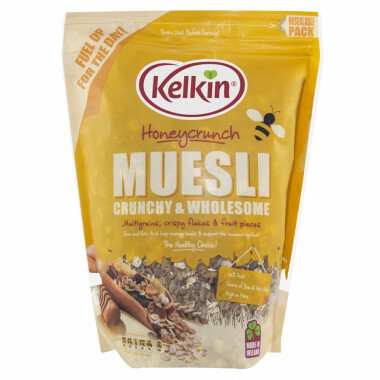 This delicious muesli is a wonderful honey-flavoured blend of fruits, nuts and cereals. Ingredients: wholegrain cereals (in variable proportions) (53%)[oats, toasted wheat flakes, (wheat, malt (barley), barley flakes], dried fruit (in variable proportions) (25%)[chopped dates (dates, rice flour), jumbo raisins [raisins, sunflower oil), sultanas (sultanas, cottonseed oil)], oat crocant (15%)[oat flakes, granola syrup (sugar, glucose syrup, salt, honey), wheat flakes, rapeseed oil, wheat crispies (wheat flour (contains calcium carbonate, iron, nicotinamide, thiamine), malted wheat flour, dextrose, malt extract, rapeseed oil), coconut], organic honey corn flakes (7%) (organic corn, organic sugar, organic wheat syrup, organic honey (5%), salt, organic barley malt, emulsifier, sunflower lecithin). Allergy advice: contains cereals containing gluten. See ingredients in bold. May contain: nuts, sesame seeds and sulfites. Store in a cool, dry, odour free place. To retain freshness use ziplock once opened.